A new report by the Urban Design Lab (UDL) of Columbia University’s Earth Institute explores the potential for urban agriculture in New York City. The report, “The Potential for Urban Agriculture in New York City,” complements the existing discussion on sustainable cities. Developing agricultural spaces within or near urban areas has a great potential to reduce food transportation costs and environmental effects, as well as provide opportunities for economic development and diminish the disparities in access to healthy foods. In order to become a viable option to food production for the masses, urban agriculture must overcome challenges of scalability, energy efficiency and labor costs. To understand the capacity of New York City’s crop production, UDL’s report aims to answer how much land could be productively used for agriculture and how much crop could realistically be grown in the given land. When it comes to the benefits of urban agriculture in New York City, the study also considers factors like food security, storm water runoff and sewer overflow mitigation, urban heat island effect, energy consumption, waste reduction, as well as opportunities for composting for agricultural purposes. 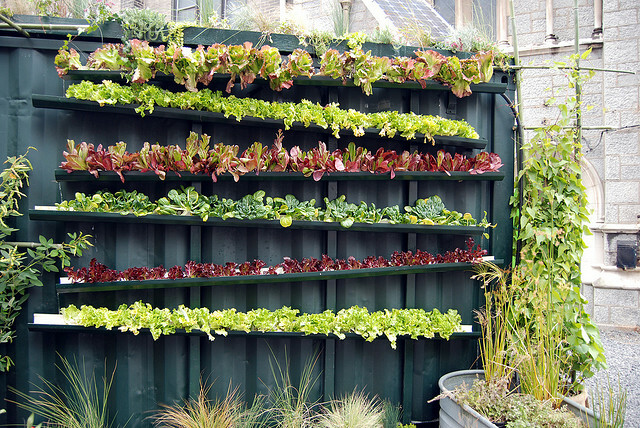 • Urban agriculture can play a critical role as productive green urban infrastructure. Urban agriculture can serve as an critical environmental service to the city through stormwater runoff mitigation, soil remediation, and energy use reduction. • Urban agriculture can play an important role in community development. Urban agriculture can be a means of transforming underutilized or neglected space into a public resource, providing opportunities for social interaction, greater community cohesion and self-sufficiency, and engagement for young people in underserved neighborhoods. • There is a substantial amount of land potentially available for urban agriculture in NYC. UDL identified almost 5,000 acres of vacant land likely to be suitable for farming in the five boroughs of New York City, the equivalent of six times the area of Central Park. But this is only a portion of the potential agricultural sites. UDL also identified more than 1,000 acres of New York City Housing Authority (NYCHA) green space, underutilized open spaces, and Greenstreets. • Intensive growing methods adapted to urban spaces can result in yields per acre which greatly exceed those of conventional production techniques. Employing high-yield or “biointensive” production techniques characteristic of urban agriculture can make the best use of available land. • While urban agriculture cannot supply the entire city with all of its food needs, in certain neighborhoods it can significantly contribute to food security. Areas with low access to healthy food retail, high prevalence of obesity and diabetes, low median income, and comparatively high availability of vacant and other available land are where urban agriculture could have the greatest impact on food security. • There is a need for cost/benefit analyses that reflect the full complexity of the city’s social and environmental challenges. In addition to environmental benefits, urban agriculture has the potential to generate revenue and provide long-term employment. • NYC’s rooftops are a vast, underused resource that could be transformed for food production. Density, public interest and support, access to capital, a robust transportation network, adequate infrastructure, proximity to institutions of higher education, and consumer demand make New York City an especially advantageous urban area on which to build urban agriculture. • Bureaucratic challenges are a major barrier to the expansion of urban farming. Land jurisdiction and management, as well as budget concerns, are major hurdles in establishing urban agriculture. • Existing infrastructure has the potential to support the expansion of urban agriculture. Churches, schools, and other institutions often have underused kitchen, refrigeration and food processing facilities. Tapping into these resources can assist in the expansion of agricultural activity in the city. • Urban farmers are establishing viable businesses by taking advantage of multiple revenue streams. In addition to selling food directly to the public, farmers have developed direct marketing relationships with restaurants and institutions, and can profit from the environmental services they are providing, such as tipping fees for collecting compostable waste. • Urban agriculture is part of a broader horticultural approach to urban greening that encompasses more than fruits and vegetables. The capacity of the city for agricultural production includes products like honey, poultry and fish. The production of non-food crops, such as flowers and raw materials, could also allow for the economic and environmental benefits of urban horticulture to be more widely distributed to sites that are not suitable for food production. • Urban agriculture functions as a catalyst for larger food system transformations. Urban farmers are developing vital connections between urban and rural communities. Urban farms in the city are creating links between low-income neighborhoods and rural farmers by instigating community-based farmers markets, providing a customer base for both the urban and rural farms simultaneously. Learn more about the Urban Design Lab here. Below, watch Dickson Despommier, a Columbia University professor specializing in vertical farming, explain urban agriculture.